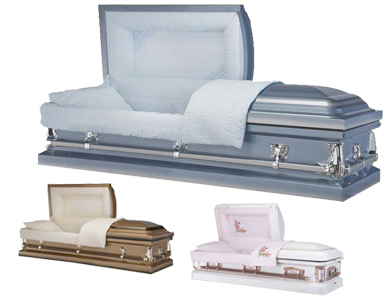 When selecting a casket, we encourage getting what is most practical for your family. We hope that you never buy on emotion when a loss has occurred, but rather being of clear, sound mind when making this decision ahead of need. We offer a variety of wood and steel designs, with unlimited interior and exterior color options. Since you no longer have to purchase a casket from the funeral home, we can show you the quality and craftsmanship that is offered with ours, along with the benefits and potential savings. We offer payment plans that will fit any budget and our prices are guaranteed, locked-in, forever. Once a casket is needed, we have it delivered directly to the funeral home of your choice, which we include in our pricing. If you have questions or need to make arrangements, please call 419 223-3811. When selecting a vault, consider your options of concrete or steel. Concrete, being the most common, offers two methods of how they are sealed. 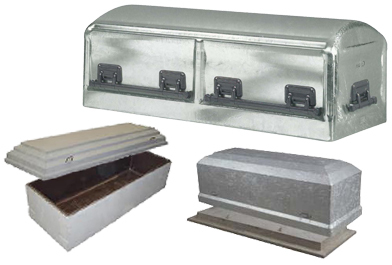 As shown in the pictures, a top-sealing lid or dome-on-base design are standard in today’s industry. Our concrete vaults are painted prior to the service, and in addition, special liners can be added upon request. Our steel vaults are offered in the dome-on-base method of sealing only. They come in several different colors, gauges of thickness, and can be galvanized. 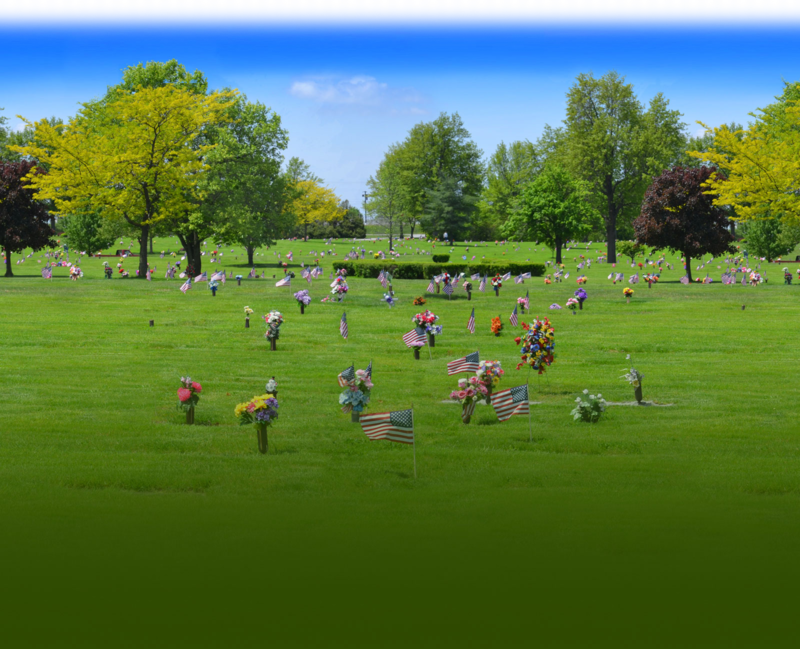 Being a cemetery-required product, along with servicing the vaults, we can eliminate the middleman and guarantee that all charges will be included in one price. 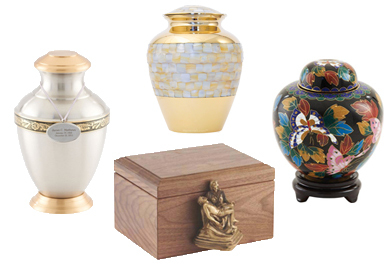 When selecting an urn, many options are available such as wood, marble, porcelain, glass, pewter, bronze, granite, biodegradable and more. We offer a variety of shapes and sizes, along with personalized charms, medallions, and engravings. The purpose of an urn is to hold the cremated remains of the deceased. Most families choose to have the urn permanently placed in a grave, with an option to purchase an urn vault for added protection, or placed in a niche located above ground. When selecting a memorial, we advise speaking with a representative from the Cemetery to determine the type of memorial permitted in your location. Each section has different regulations and requirements and that is why we take the time to guide you through the various options available. 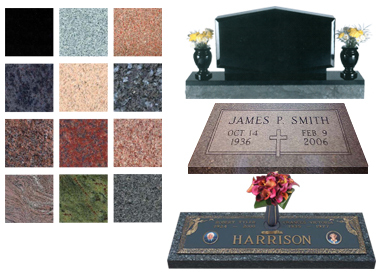 Again, being a cemetery-related product, we know the quality, size, style and requirements needed to create a fitting memorial for each family. We offer unlimited color options, designs and styles that will truly reflect how special the person was and the life they lived. Please stop by our office, located inside the cemetery, so we may show you all of the traditional and contemporary designs that are offered. 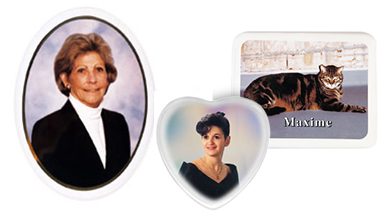 When selecting a permanent photograph, look no further than our Cemetery. We offer a variety of images from single and double portraits, colorful backdrops, and special wording to personalize each and every portrait. We stand behind our quality and protect against damage, theft and sun-fading. They can be placed on a mausoleum crypt front or any type of flat or upright memorial. When selecting a floral vase, consider your options when decorating a loved one’s gravesite. 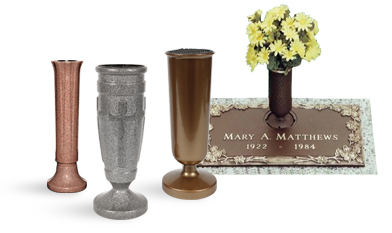 Whether the vase is installed on a monument, mausoleum crypt front, cast into a bronze memorial or as a separate unit that is positioned behind the flat marker, we offer a variety of styles, colors and designs to suit anyone’s budget. A copy of our decoration rules can be found under recent loss in the menu.